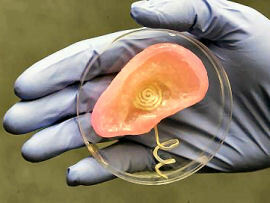 Standard tissue engineering involves seeding types of cells, such as those that form ear cartilage, onto a scaffold of a polymer material called a hydrogel. 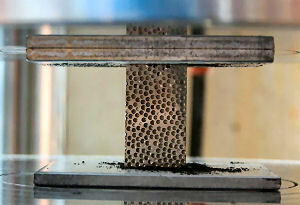 However, the researchers said that this technique has problems replicating complicated three dimensional biological structures. Ear reconstruction “remains one of the most difficult problems in the field of plastic and reconstructive surgery,” they write. The finished ear consists of a coiled antenna inside a cartilage structure. Two wires lead from the base of the ear and wind around a helical “cochlea” – the part of the ear that senses sound – which can connect to electrodes. 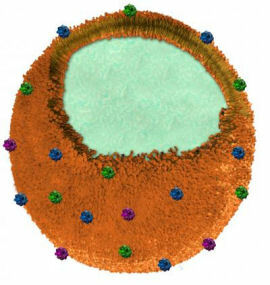 The researchers say that the ear could, in principle, be used to restore or enhance human hearing. The current prototype receives radio waves, but the team plans to incorporate other materials, such as pressure-sensitive electronic sensors, to enable the ear to register acoustic waves.